Mankind has used knives for everything from slicing bread, to self defense, to Medical uses, and all points in between. Like many a young man, I have felt the draw towards knives from the moment I was given my first pocket knife, and even past the next day when it was taken away for carving my name in something I shouldn’t have. In my down time, that is those times I couldn’t find an excuse to be cutting or carving or slicing something, I did the next best thing… I looked for knives in movies and TV shows. So, I present to you my list of Iconic Knives of screen and film. 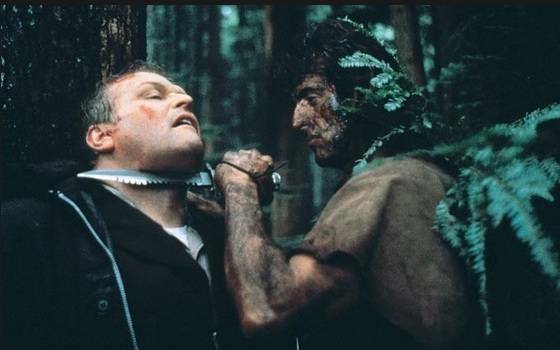 One of my favorite movie knives of all time, that started a trend itself, was John Rambo’s knife in First Blood. Soon after the movie hit the big screen, half the teen age boys in America had a big ol survival knife, yours truly included. The actual knife was created for the movie, by custom BladeSmith Jimmy Lile. Tip of the hat to whomever decided to use a real knife instead of some prop. Next is another pure 80’s Classic, although more people will probably remember the line “That’s not a knife. 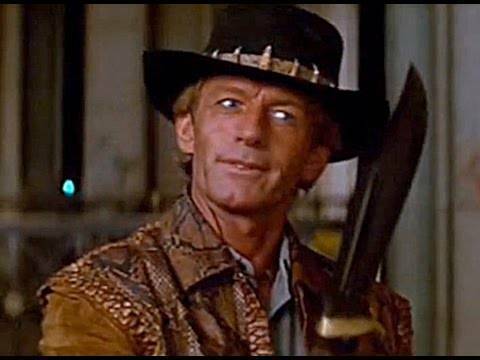 This is a Knife!” as actor Paul Hogan said in the famous Crocodile Dundee movie. Who couldn’t resist a big smile when watching him hold that big Bowie style knife up. The actual knife was created by John Bowring, again just for the movie. It’s said that Paul Hogan was given the original with the promise he was never to sell it. Very large Bowie knives became even more popular following the film. Fans also made sure the knife was used in the sequel it had such a large following. No movie or TV knife list would be complete without mentioning a show that featured a knife dang near every episode. The knives may not have been as flashy as some, but Macgyver found a use for them. His go to tool, was generally some version of the famed “Swiss Army Knife”. Victorinox brand was used mainly, but Wenger versions made it onto the screen as well. Victorinox’s “Tinker” model being the most used overall. Fans of the show and of the “Swiss Army Knife” but know how great these knives are… but who knew you could defuse a Nuke with one? Another one from the big screen comes from the movie Cobra staring Sylvester Stallone. 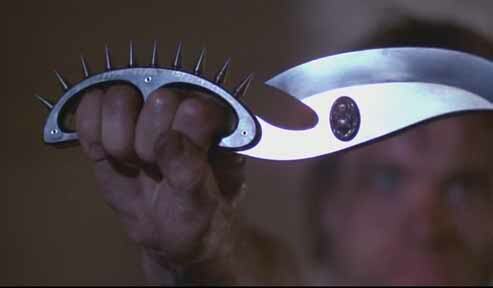 While both Stallone and the bad guy both carry blades, it was the ominous looking, spiked knuckle duster style carried by the “Night Slasher” played by Brian Thompson that gave me nightmares. The Original Knife was made by Knifemaker Herman Schnider, but reproductions are still to be found at gun shows and flea markets. 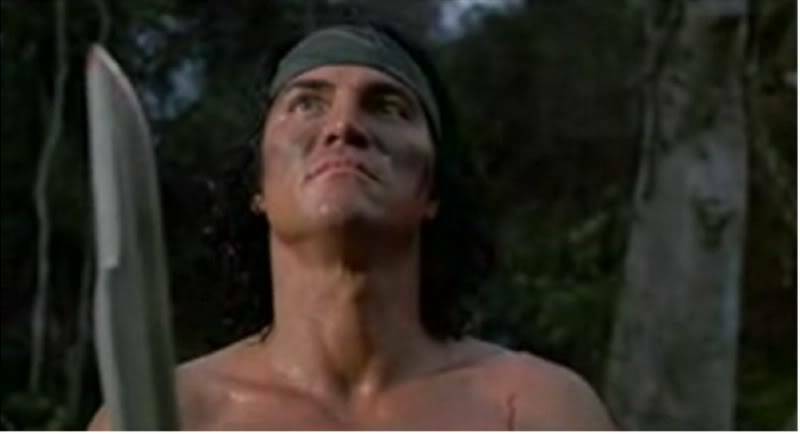 I remember watching the movie “Predator” and getting all aflutter looking at that big beautiful knife carried by Billy the Tracker Guy, played by Sonny Landham. That knife was a monster made by BladeSmith Jack Crain. I wanted one then, And I still want one today. On a side note, Crain also provided knives for the movie “Commando”. So what knives have you seen in movies and on Tv? Have you ever noticed what Hannibal Lecter uses? 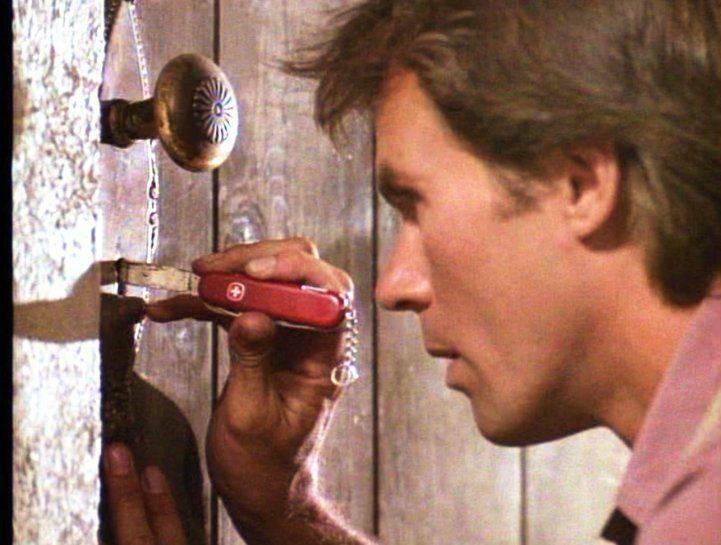 We’ve also created a Facebook group about knives in movies: Movie Knife Database. » Other » Have You Noticed The Knives in These Five Iconic Movies?